Patterns of Enterprise Application Architecture is written in direct response to the stiff challenges that face enterprise application developers. The author, noted object-oriented designer Martin Fowler, noticed that despite changes in technology - from Smalltalk to CORBA to Java to .NET--the same basic design ideas can be adapted and applied to solve common problems. With the help of an expert group of contributors, Martin distills over forty recurring solutions into patterns. 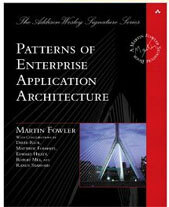 The result is an indispensable handbook of solutions that are applicable to any enterprise application platform.